Award. The Award will be presented to Dr. Bénard at the 2017 WRSNM Annual Meeting, November 3-5, 2017 at the Westin Bayshore Hotel in Vancouver. The Award is given annually at the WRSNM Meeting to an individual who has made significant contributions to the Clinical Science of Nuclear Medicine or Molecular Imaging. 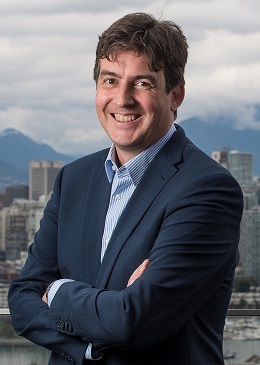 Dr. Bénard is the Vice President, Research at the BC Cancer Agency, a Distinguished Scientist at the BC Cancer Agency Research Centre and Professor in the Department of Radiology at the University of British Columbia. He is also Associate Dean, Research at the University of British Columbia. In addition he holds the BC Leadership Chair in Functional Cancer Imaging. As a clinician scientist, his research interests are in positron emission tomography (PET), nuclear medicine, cancer imaging and targeted radionuclide therapy. His team developed several new radiopharmaceuticals targeting tumour receptors, notably peptides and small molecule ligands. He initiated the program that developed cyclotron production of 99mTc, now in clinical trials at multiple sites in Canada. He has established extensive multidisciplinary collaborations, and he and his colleagues were awarded the 2015 Brockhouse Canada Prize for Interdisciplinary Research in Science and Engineering by NSERC. Dr. Bénard received his degree in College Studies in 1987 from the Séminaire de Sherbrooke in Sherbrooke, Québec and went on to receive his Doctorate in Medicine in 1991 from the Université de Sherbrooke. He undertook Specialized Studies in Nuclear Medicine at the Université de Sherbrooke from 1991 to 1995 and then received a PET Research Fellowship from 1995-1998 from the University of Pennsylvania in Philadelphia. Dr. Bénard was at the University of Sherbrooke from 1998-2008 at which point he relocated to Vancouver to join the University of British Columbia and the BC Cancer Agency.